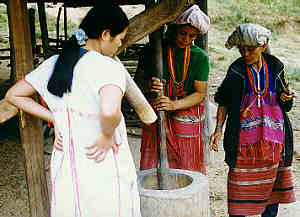 Working Karen Women, Karen Village in Chiang Mai Province, Northern Thailand. The majority of the Karen people live in Burma, and yet they also form by far the largest of the major tribes of northern Thailand. There are as many as 280000 Karens living in Thailand. They can be found living both in the mountains and on the plains, most of them in the provinces of Chiang Mai, Mae Hong Sorn, Chiang Rai, but also in central Thailand. They live in bamboo houses raised on stilts, beneath which live their domestic animals, pigs, chickens and buffalos. The mountain-dwelling Karens practice swidden agriculture, and the plains-dwellers, for the most part, cultivate irrigated paddy fields. Karen Woman (Karien), Karen Village in Chiang Mai Province, Northern Thailand. 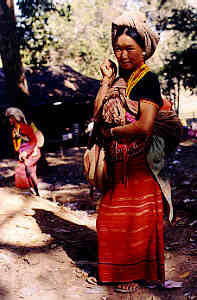 Karen women are noted for their skill in weaving, which is done on a back-strap loom. Each of the many sections of this large ethnic group has its own style of dress. Unmarried girls wear loose white vee necked blouses. Married women wear blouses and skirts in bold colours, predominantly blue and red. Karen men produce musical instruments, animal bells, unique tobacco pipes and numerous other crafted items. Karens are originally animist, but about 25% of Karens living in Thailand have been converted to christianity by western missionaries. The Karen people are very peaceful and cooperative, who like the other hilltribes, reserve their highest veneration for their ancestors and living elders.